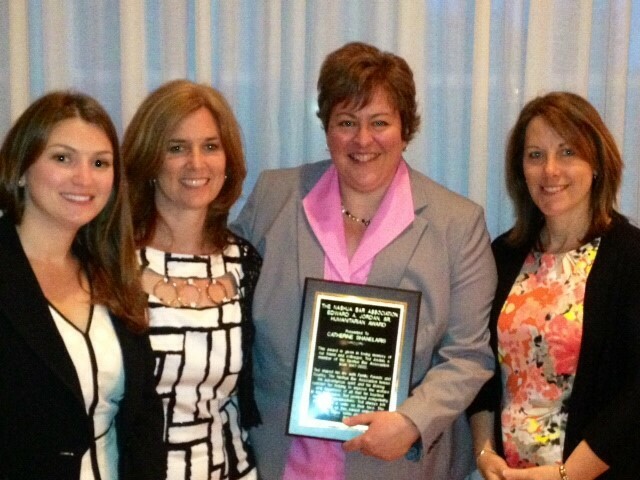 Our very own Cathy Shanelaris is 2014’s recipient of the Ted Jordan Award! This award is given in memory of Ted Jordan, a member of the Nashua Bar Association from 1967 to 2002. Ted is remembered for his adventurous spirit and lifelong concern for helping to improve the local bar association and community, and the award is presented annually to an individual who embodies Ted’s same ideals. This award is particularly special because Cathy was selected by her fellow Nashua Bar Association members in recognition of her efforts and contributions to the practice of law, and to the community she serves. We congratulate Cathy on this well-deserved honor!